Trendy bars and cafes are popping up left, right and centre in London around the industrial estates of Tottenham. Five Miles is one of many, and just a short walk from Seven Sisters station. This is one of those venues that offer everything from nights to food to cocktails on tap. There’s even a brewery on site, meaning that they boast a number of changing lagers and ales – certainly a spot for the craft beer lovers. They’ve also opened a new Middle-East inspired restaurant, Torshi, which promises to serve a variety of tasty sharing dishes including halloumi fries with pomegranate ketchup and fried chicken with pickled watermelon. Yum. Brunch served Tue – Sun 12:00 – 16:00 and dinner Wed – Sat 18:00 – 22:00. 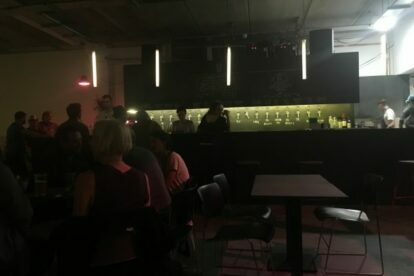 On Sundays, they have an open record day, meaning you can bring your own records and listen to them through their high-quality sound system while enjoying a pint. Despite all this on offer, the best thing about this place for me is their entrance policy; ‘No sexism. No racism. No ableism. No homophobia. No fatphobia. No transphobia. No hatefulness.’ Not only does this help attract the right kind of nights, it helps attract the right kind of crowd.